Casey Page Culbreth is a worship leader and seminary graduate. She leads worship at churches and ministries in America and internationally. You can find out more about Casey’s ministry on her website: www.caseypage.com. Review: Chris Webb, God-Soaked Life: Discovering a Kingdom Spirituality (Downers Grove, IL: InterVarsity Press, 2017). Do you know how to be in the Presence of the Lord? 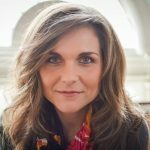 Casey Culbreth shares what she learned from The God Soaked Life by Chris Webb.